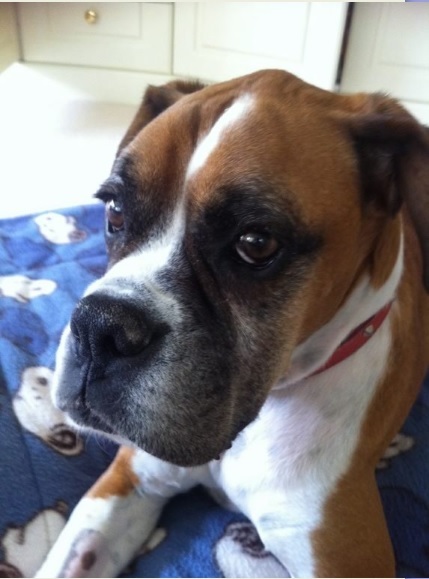 It came as quite a shock when we received a card from Oscar’s owner saying that he had fallen ill and had passed away. Oscar was just 9 years and 4 months in some senses still quite young. Oscar had been coming to our kennels since he was a pup – we always enjoyed his visits – we would pick him up from home and simply leave the van open and he would jump in – impatient to go on his holiday. To walk him was a delight – his eyes would be shining he would run ahead, run back to see where you were and, in common with all boxers, would do an excited twirl before running off again. When it came to take him home he was just as keen to get back to his usual haunts – it was as if he was determined to make every day an excellent day.